Spell Casting vs. Cursing. 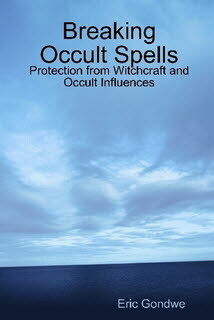 Breaking Occult Spells: Protection from Witchcraft and Occult Influences. "They overcame him by the blood of the Lamb and by the word of their testimony,” Revelation 12:11. Are spells in a different category from curses? Some fellow believers in the body of Christ identify curses and spells as being in the same category. They argue that since curses are intended to bring harm they are thus in the same category as occult spells. By the time you’ve reached this stage of reading this book you probably know that this is not biblically accurate. Curses are curses while spells are spells. They are not the same. Maybe that's why the Lord had me to write two separate books: one on breaking curses and another on breaking spells. There are also many books out there that correctly separate the two, in line with the scriptures. Occult spells work to tap into the spirit realm in order to influence matters in the physical realm. Curses on the other hand use the creative and destructive power of words uttered or expressed in the physical realm in order to influence matters in the physical realm. Occult spells first have to tap into or connect with the spirit realm while curses are earthly in nature. Thus one is spiritual in nature while another is earthly in nature. Spells have all the above characteristics while curses have none of them. Spells are a form of witchcraft that not only constitute words but also involve the use of occult symbols and other ritualistic acts. A person casting spells is in full knowledge of what he/she wants to accomplish through his/her occult spell casting practices. On the other hand, a person cursing another may be doing it out of ignorance of the power of words in the earthly realm. Spells are therefore from people in the occult. This is why they’re also called occult spells. Curses on the other hand can be from people close to one’s life, including from fellow Christians, from strangers, from malicious people, or from people in the occult. A shared attribute spells and curses have is that they originate from or are channeled through people. Spirits cannot curse, neither can they cast spells. My other book, Breaking Curses, Including Breaking Generational Curses, has more extensive info on curses. Another similar attribute they have is that they both have spiritual repercussions. The words we speak here on earth have spiritual repercussions. God takes them as binding testimonies of what we want fulfilled in our lives or in the lives of others. The same creative power of words that God has when he spoke the whole creation into existence he has also given to us. The creative power of words God has given to humanity can be used for good or for all evil, for blessing or for cursing, for success or for failure, and so on. My other book on breaking curses has more extensive info on curses. There are spiritual repercussions of occult spells in their sorcery nature of tapping into the spirit world. Occult spells use a method that is outside the bible for influencing matters on earth.